KRAKOW TOURS – Since early morning households have been buzzing with last minute preparations for the most festive supper of the entire year – Wigilia – eaten as the first star appears in the night sky. Today is not a national holiday, though employees will be finishing work early and rushing home to get ready for what awaits. In the evening family and friends sit down to the Christmas Eve table. And there are certain must-dos which have to be observed during the occasion, regardless of the family’s social and financial status or any additional regional customs. The table cloth must be impeccably white with a small bundle of hay underneath it. A separate, empty plate should be set for an unexpected guest or exhausted wanderer who may knock on our door. The Wigilia feast consists of twelve courses, including such delicacies as pierogi, uszka and barszcz (various kinds of dumplings with beetroot soup) or fried carp, just to name a few of a whole gamut of possibilities. However, the whole supper begins with breaking the oplatek, or Christmas wafer and exchanging best wishes among the gathered. Many families still find enough musical courage to engage in singing beautiful Polish carols. Kids too, have their joyous moments as Santa makes his stop over in Poland on Christmas Eve. To crown the daylong celebrations there is Midnight Mass, which attracts millions of faithful to churches across the country. Perfect, Just perfect brief description of Krakow. An Englishman in Krakow……well Warsaw actually. Polish PM Donald Tusk has criticised an investigation by Russia into a deadly plane crash which killed the country’s president in April. He said it was “unacceptable” and some conclusions “without foundation”. Russia recently handed Poland a draft report of the incident after months of investigation, though it has not been made public. Former President Lech Kaczynski and other senior officials were among 96 people killed in the crash. The plane came down near the western Russian town of Smolensk. Without revealing details of the report, Mr Tusk said it did not comply fully with the Chicago Convention which regulates international air travel. “From the Polish point of view, the draft report from the Russian side as it has been sent is without question unacceptable,” he said in televised comments to reporters in Brussels. “This negligence and mistakes or lack of positive reaction to what Poland has been asking for, all these things allow us to say that some of the report’s conclusions are without foundation,” he added. Russian President Dmitry Medvedev visited Poland last week and reiterated a promise to cooperate over the crash investigation. Poland’s first couple – along with other leading political and military figures – were on their way to a memorial ceremony for the World War II Katyn massacre when their plane crashed in poor weather on 10 April. Russian Prime Minister Vladimir Putin was praised for his sensitive handling of the situation in the aftermath of the crash, which killed all those on board. KRAKOW TOURS – The German Foreign Ministry has announced that it will donate 60 million euro to the Auschwitz-Birkenau Foundation, the fund-raising body for the preservation of the Nazi concentration camp’s site in southern Poland. Berlin is set to donate the money in five equal yearly payments starting in 2011, the ministry stated, Wednesday. Following an agreement signed between the federal authorities and representatives of Germany’s federal states, the Federal Government will pay 30 million euro, with the other half directly coming from the country’s states. “Through the donations to the Auschwitz-Birkenau Foundation, Germany recognises its historical responsibility for the support and transfer of memory of the Holocaust to future generations,” Foreign Minister Guido Westerwelle published in an official statement. The Auschwitz-Birkenau Foundation was created in 2009 thanks to the initiative of Wladyslaw Bartoszewski, the PM’s plenipotentiary for international dialogue, and more pertinently perhaps, a former inmate of Auschwitz. The Foundation’s activity is aimed at the preservation of around 155 buildings, 300 ruins and thousands of other exhibits, including documents and archive materials. According to the Foundation, around 120 million euro is needed for the upkeep of the Museum site for years to come. 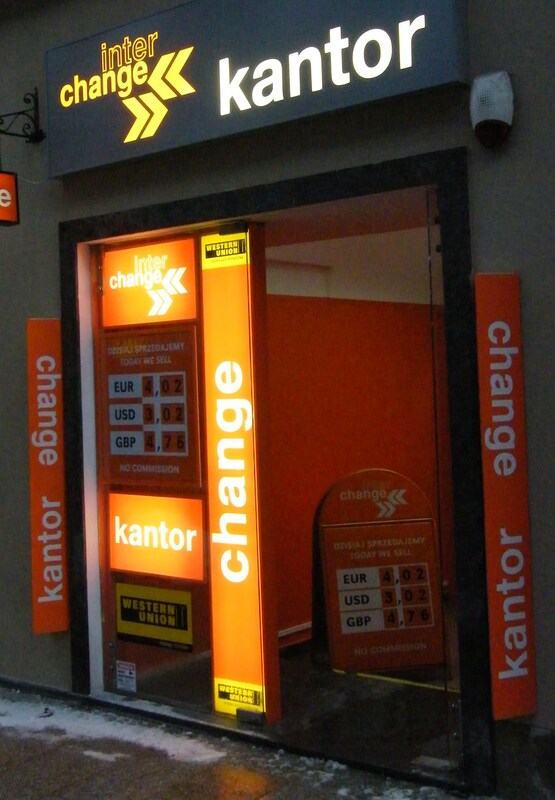 There’s been a lot written already about the ‘Interchange Kantors’ that are cropping up all over Krakow. Yesterday (14/12/2010) I decided to test them out. I first went to the one on Florianska and asked what the ‘Buy’ rate is for GBP, they appeared very confused and asked if I wanted to buy pounds, i repeated that I wanted to know what their ‘Buy rate’ was for GBP. They asked how much I wanted to change, i replied £200, and I was then offered a rate of 4.29 zloty to the pound, I laughed and left. The ‘Buy’ rate was written on a white board behind the counter which was obviously not meant to be seen by unsuspecting tourists. Next I went to the shop on Grodzka, pictured below, they proudly announce a rate ‘Sell’ rate of 4.76zl to the pound outside the shop, inside is a different story, again the ‘Buy’ rate is barely visible on a white board behind the counter. I asked to change £200 again and was offered a rate of 3.45 zloty to the pound, I laughed and started to leave, so they offered me 4.29 which apparently is the rate available if you want over 4000 zloty, so they were doing me a big favour!!! 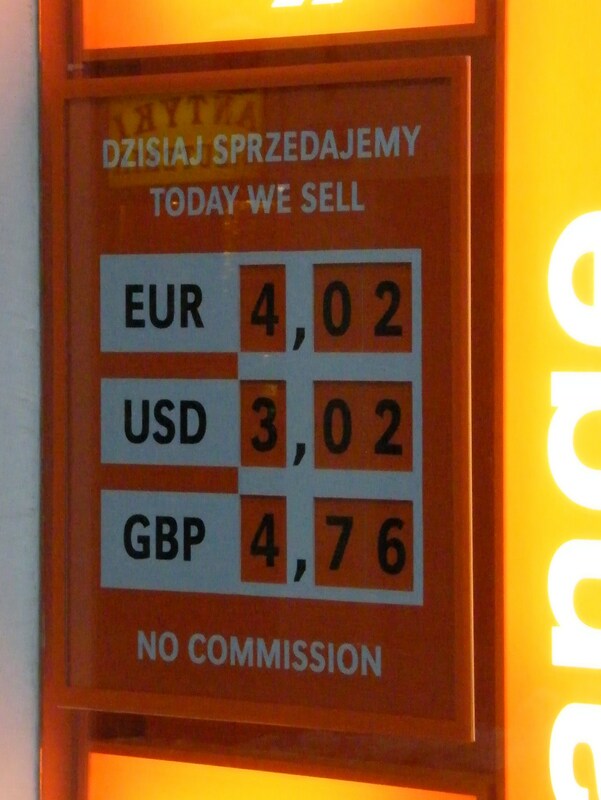 The best rate I saw available in Krakow yesterday afternoon was 4.675 to the pound. Almost 10% more than the best offer from Interchange, and a massive 35% more than 1 of their offers. The Interchange Kantors are there to RIP OFF the tourists and should be avoided at all cost. Polish local presidential candidate and the strippers. This is Włodzimierz Tomaszewski, a recent candidate for president in Łódż, appearing in his ‘Party Political Broadcast’ extolling the virtues of Łódż as a cultural centre. Keep this up and the British Stag Parties will be flocking there in their thousands. A couple of driving videos from Poland, and this is before the snow hit us.